Granted in 1737 and incorporated in 1754, Greenwich, Mass., was the first town in the Swift River Valley settled by Europeans. Sitting astride the East and Middle branches of the Swift River and forming the eastern boundary of Hampshire County, Greenwich was primarily an agricultural town with light manufacturing and, beginning in the later nineteenth century, an active tourist trade. The town's population peaked at over 1,100 early in the nineteenth century, declining slowly thereafter. 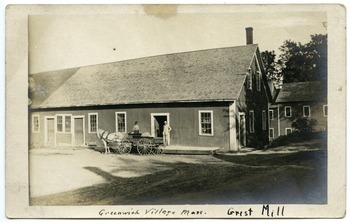 The photographic postcards in this collection all relate to the Quabbin town of Greenwich and were originally housed in an album of uncertain provenance. Primarily "real photo" postcards and dating between approximately 1908 and 1928, they were labeled by a knowledgeable, but unknown person at a later date to identify the houses, roads, stores, and views. Unlike many of the commercial postcards of the day, they present a very down-to-earth view of the town, its rocky fields, mills, houses and stores, and its summer hotels. Although the name of the person who assembled the album is not known, it is possible that he or she was a member of the Walker family. Two of the postcards are addressed to Freeman Walker and the handwritten caption on one image makes reference to "Uncle Will" Walker's corn crib. Use: letter to Freeman Walker, Hanover, Mass. Spiritualist Church, Lucy Parker's House, Greenwich Village, Mass. Old toll gate house, Greenwich Village, Mass. Gift of Kenneth G. Skinner, May 2018. Cite as: Kenneth G. Skinner Collection (MS 1027). Special Collections and University Archives, University of Massachusetts Amherst Libraries.